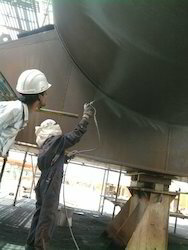 Prominent & Leading Service Provider from Nagpur, we offer shot blasting services. We are known in the market for providing Shot Blasting services to our esteemed clients. Our services find usage in agricultural, industrial and construction areas for painting all kinds of machines & equipment. The entire blast operation is carried out on the whole component surface. Furthermore, our services are suitable for earth moving machinery components, crane components and prefabricated structures. Looking for Shot Blasting ?